Deputy Dawes, 43, and Echo City Constable Thomas Stagg were killed in a gun battle near the Wyoming border. The victims were part of a four-man posse alerted to watch for two suspects who had attempted to murder the Summit County sheriff. Receiving word that the suspects were hiding in a cabin on Duck Creek, approximately 12 miles west of Evanston, the posse surrounded the cabin in the early morning hours. When the sun rose, a gun battle erupted. One of the suspects suffered a minor wound. 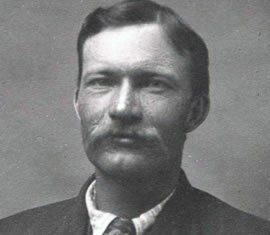 Constable Stagg was shot in the throat and died immediately. Deputy Dawes was shot through the lungs. Their ammunition exhausted, the two remaining posse members withdrew. Following a massive manhunt and another gun battle, the two suspects were captured in Tooele County on August 5. One suspect was convicted and subsequently executed by firing squad in 1896. The second suspect was sentenced to prison and paroled in 1902. Deputy Dawes left a wife. He is buried in Evanston (Wyoming) Cemetery. His bronze name plaque is sponsored by AAA Utah.